TL; DR: Boasting a customer list with the likes of Red Hat, Alibaba, Sony, Uber, and StackExchange, GitLab helps more than 100,000 organizations rapidly build, test, and deploy code. Originally built as an open-source side project, the Co-Founders expanded GitLab to include repository management, issue tracking, code review, and tools for continuous integration and deployment. Teams large and small can collaborate with GitLab, an all-in-one platform that encompasses the entire development cycle. GitLab boasts more than 1,400 contributors to the open-source community edition and continually adds features to two commercial products. As a PHP developer in the Ukraine, Dmitriy Zaporozhets wanted to switch from Apache Subversion to the increasingly popular git version control system. Existing products, however, were too expensive and couldn’t be run on-premises. As any proper engineer would, he started building his own solution at home as a side project. However, there’s a twist to the classic tech founding story: Dmitriy didn’t have running water. “He would take two buckets, walk to the well, get water, and then spend his nights doing more important things,” said Job van der Voort, a long-time employee. Developers around the world now know Dmitriy’s work at GitLab, a comprehensive platform that enables teams to collaboratively write, test, and deploy code. The web-based application integrates all phases of the development cycle, including tools for code review, issue tracking, activity feeds, wikis, and continuous integration. Used by the likes of SanDisk, Red Hat, NASA, Sony, VMware, and Citrix, GitLab balances the open-source needs of small organizations with the added control and user management requirements of large enterprises. From the first, rather unassuming commit, Dmitriy and Valery Sizov made GitLab an open-source program and released a new version every month on the 22nd. “We’ve stuck with that and still do that today,” said Job, now the Vice President of Product at GitLab. GitLab, which Dmitriy and Valery wrote in Ruby, originally concentrated on git repository management. Shared and distributed under the MIT license, GitLab amassed more than 300 contributions in the system’s first year. One of GitLab’s early open-source users, Sid Sijbrandij, wanted to use the system to create a Software-as-a-Service product to compete with GitHub. Hundreds of people signed up for the 2012 beta versions, and larger companies began asking for new features. Sid, who had notified Dmitriy about his SaaS aspirations for GitLab, contacted him again after seeing a tweet expressing Dmitriy’s desire to work on GitLab full time. Job credits one of the early features for GitLab’s growth and popularity. Being the ever-resourceful engineer, Dmitriy had built a continuous integration, or CI, solution to help the company keep up with development and the release cycles. As git gained popularity, development teams used separate programs for hosting repositories, tracking issues, and deploying code changes. Introducing CI practices and tools with the shared repositories in GitLab quickly demonstrated several advantages, mostly surrounding the speed at which teams can move throughout the development lifecycle. More rapid integrations enable developers to quickly identify bugs, gather feedback, make changes, and deploy to production. As developers are expected to play increasingly large roles across an application’s lifecycle, the need for a consolidated platform becomes more and more important, according to Job. The open-source version of GitLab remains under the MIT license and is free for unlimited users to download and adapt. 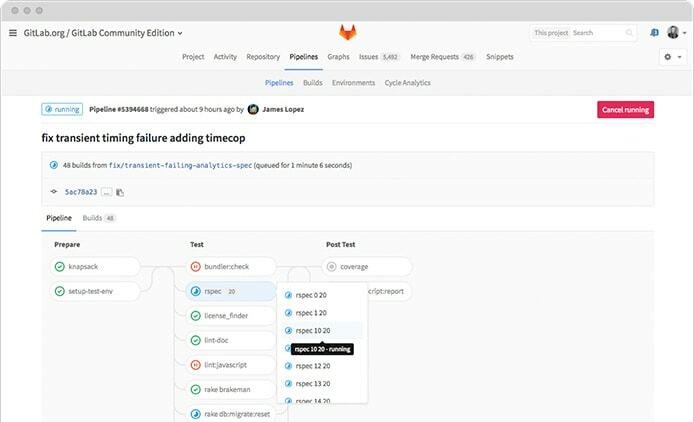 In addition to the built-in continuous integration tools, GitLab provides an analytics dashboard that enables small teams to measure how much time each phase of the development cycle takes. Development teams can organize and track bugs and assignments in detail using issue boards. Users can create websites for their GitLab projects, groups, or account, hosted for free on GitLab.com. Enterprise customers can host GitLab Pages on their self-hosted GitLab installation. 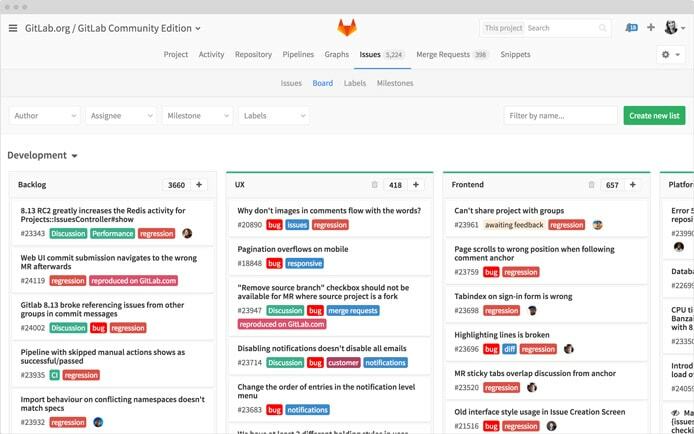 To usher an application or project through the development process, GitLab provides issue boards and review applications, which automatically spin up dynamic environments for merge requests. Commercial versions of GitLab are split into two versions: Enterprise Edition Starter and Enterprise Edition Premium. Both platforms, according to Job, are ideal for larger teams that need additional security and workflow controls. 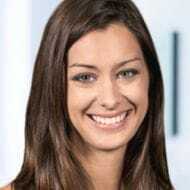 The starter edition introduces user management and code approval tools, while the premium version also includes top-tier support, training, audit logs, disaster recovery services, high-availability support, and load balancing. The team introduced Auto Deploy at the end of 2016 to automate containers, orchestration, deployment, and review processes. The new tools enable developers to set up and deploy a Ruby application with review apps, multiple environments, and ChatOps to a Kubernetes cluster in about 12 minutes — a process that could take days or weeks without GitLab.